Guess what....we are late (yet again) with this update! What a long winter we have all had. It was a cold one both in France and in the UK. But here we are looking forward to a nice spring and as we look out at the rain, we think it's about time. We tend to keep an eye on weather forecasts in different parts of world, especially within France and places where we have friends wintering. We just like to know that it isn't just St. Jean de Losne that is having a cold snap. 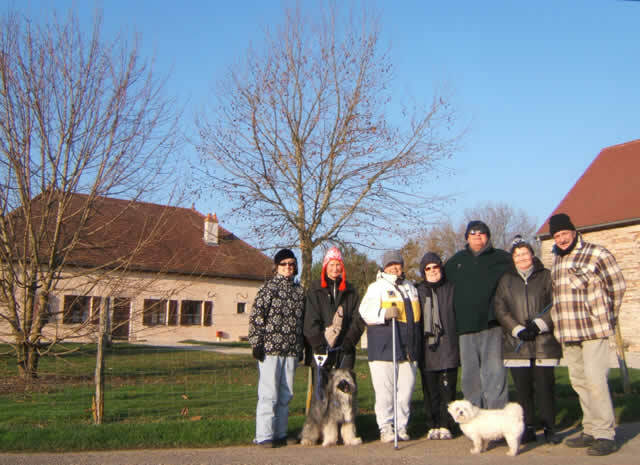 But even when it is cold, if it is sunny, it's great and we all enjoy the Monday morning walk. We weren't to know at this early stage that our new winter visitors were going to be some of the best we have ever had. Friendly, helpful, funny and lots from up north. "What a good do"
When Christmas arrived Ann and Lawrence invited the art group around for what has become a traditional lunchtime drink on Christmas Day. Then John and Hazel invited the First Aid Class around for Sunday afternoon tea. It was a lovely day. New Years Eve approached and there didn't seem to be anything happening. This was mentioned in passing to Sylvie and Gérard of Les Charmilles B&B and after pondering a while they suggested that they could maybe accommodate a dozen or so people around for Reveillon (New Year's Eve). It was a very nice invitation but not easy to start selecting who should be invited. So we looked at all the activities that were taking place every week, counted all the people who had joined in those activities and came up with more than a dozen. Sylvie and Gérard both thought the number would be ok. Brilliant! 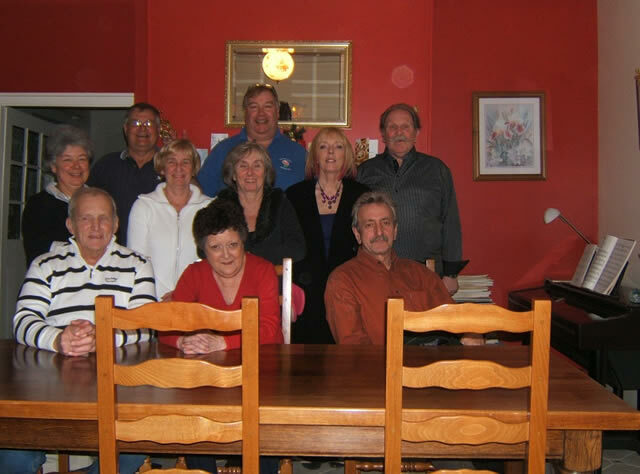 Pamela's sister Pat was over for her Christmas/New Year pilgrimage to St. Jean de Losne. She didn't fancy staying on Lea Crest with Gromit whilst we were out revelling so Pat also accepted the invite.
. eating, drinking and dancing. 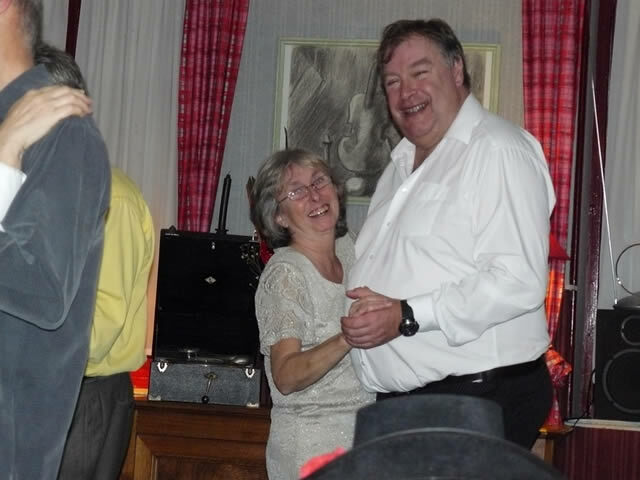 We thought that just a couple of pictures of this event would be enough and our next photo is of Pamela and Terry (the odd couple) dancing. You will see as this update unfolds, that Terry is a man of many other talents too. 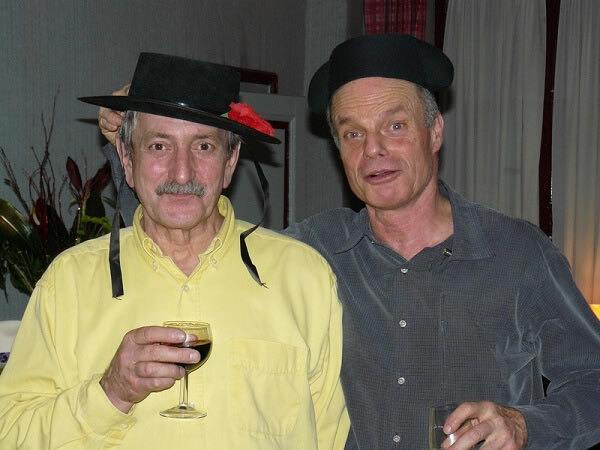 As the evening progressed, I was asked if Gérard and myself would pose as a couple of drunks. Gérard agreed, but as you can see, we aren't very good at it. You may remember that at the end of our last update, we had a picture of our friends Ali and Karen who had just got married. 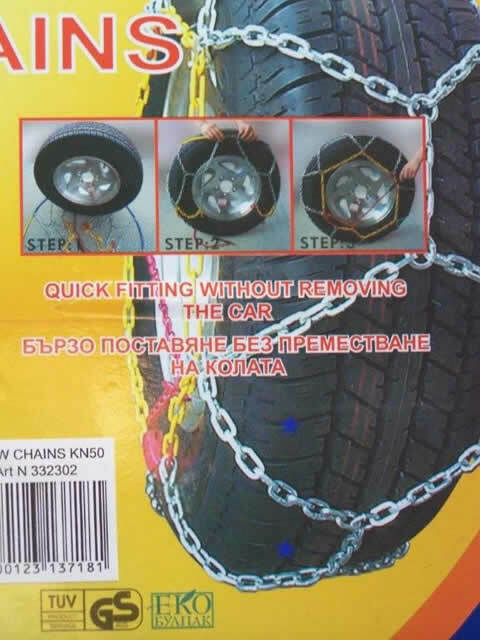 They sent us this picture of a box that contained some snow chains. They live in Bulgaria and the translation on the box does seem to leave a little to be desired. 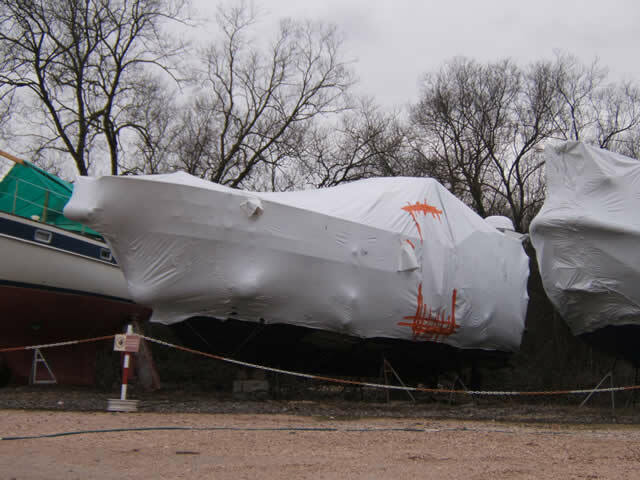 Our next photo looks like it is of an unwanted Christmas present as it is still wrapped up. But rumour has it that this is actually a new idea for wintering your boat. If so, it might be a good idea to make sure you don't leave anything behind as in this case it looks like some-one had to go back in for something! I wonder if it was for the car keys? 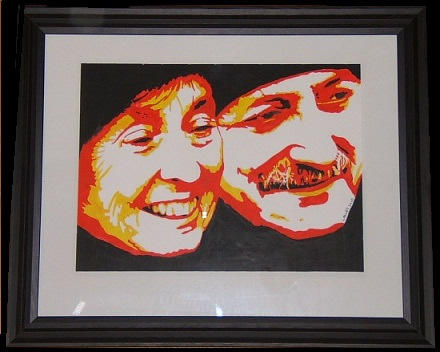 Now Terry (otherwise known as Fred Astaire) is also an accomplished artist and did this very flattering painting of us. He has done quite a few paintings in this style this winter and we don't think he has done a bad one yet! (unless of course he hides them on his boat?). 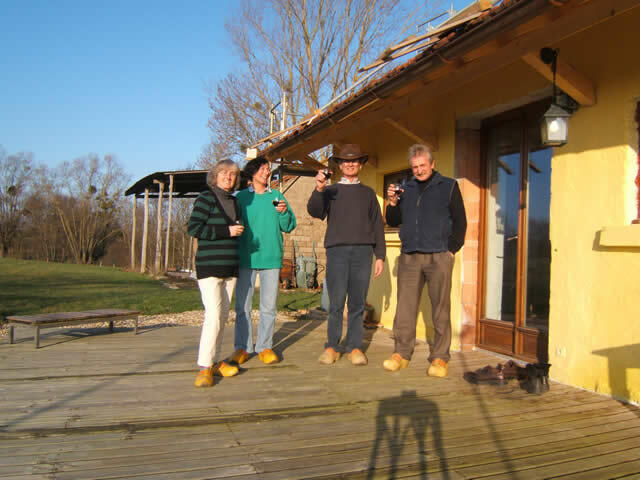 In early February we were invited to have lunch with our Dutch friends Pim and Karen who have a farm in the Jura region. 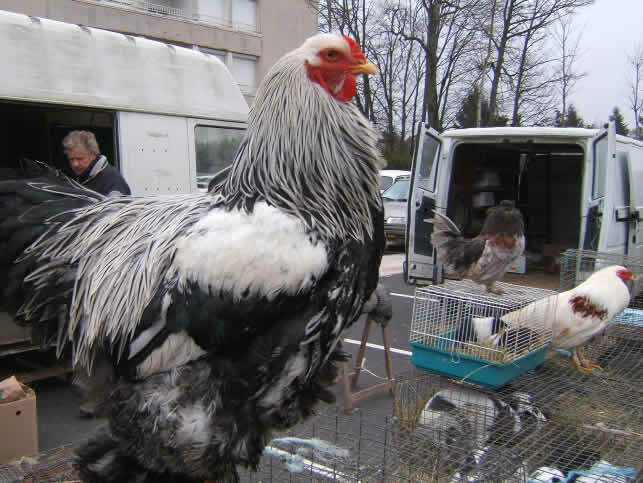 This was a perfect opportunity to give Louhans market a visit as its not far from there and, as you can see in our next photo, it makes a change to see livestock for sale. 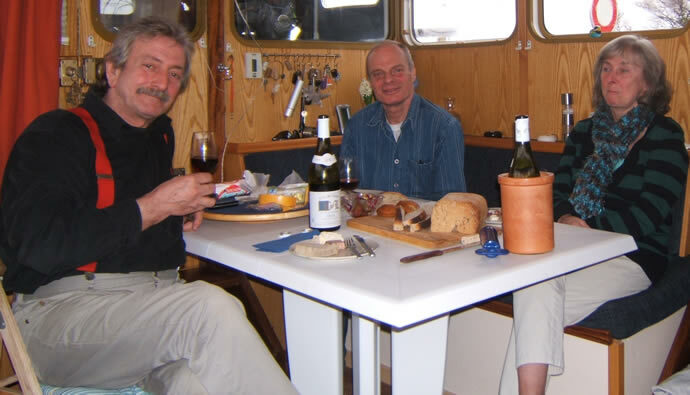 Pim and Karen keep their boat JONGE JELLE in St. Jean de Losne and when they visit it they usually drop in to see us at the same time. At the farm we couldn't help noticing that they both wear clogs outside the house and each keep a pair at both front and back doors. Now as we both wear plastic versions of clogs, we took a keen interest in Pim's wooden ones and before we knew where we were, Pim produced a brand new pair in my size. Then on their next visit, Karen produced a new pair for Pamela. We are trying to steer clear of any morris dancers now! He just happens to be an accomplished Guitarist too! Is there no end to this man's talents??? Now Jo, who looks up to Terry (as we all do, with Terry being about 9 foot 13), is also a man of many talents and annually he has a birthday. His wife Janna (also very talented) thought it would be a good idea to have an evening of entertainment that he wouldn't forget. Jo had always wanted to see the northern lights (Aurora Borealis) as a 50th birthday treat. But, like us, they aren't rich either. So Janna went to France Decor (which is now a bazaar and sells everything you never needed) and bought 2 packets of fireworks (seven big fire works in total) so that Jo could have northern lights of his own. If only they had all gone off! Still 3 out of 7 wasn't too bad! This momentous event took place on and around Ken and Rhonda's boat SOMEWHERE. Their dog Harry decided that fireworks weren't his idea of fun so he decided to get back onto the boat. Unfortunately for Harry the gangplank was full of spectators. So he decided to jump for it instead. But his tremendous leap left him in the Bourgogne canal. What comes in handy in such circumstances? The doggy paddle of course and Harry is a dab hand/paw at that so he wasn't in there for long. What a little character Harry is. 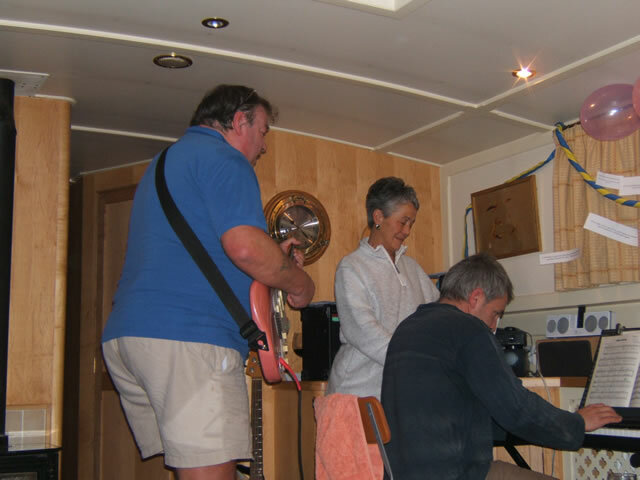 After all the excitement, we all settled down to Terry and Jo playing tunes and songs from way back when, whilst Vivienne turned over a new leaf for them. On a more serious note, we were walking to the supermarket one Sunday morning when we came across an elderly lady sat by the canal. She was wet and very, very, cold . There was snow on the ground and the lady was clearly in need of some help. Fortunately she was able to tell us where she lived so we managed to get her home and, with help from her neighbours, we were able to get the medics etc. Later we learned that she had hypothermia and some sort of heart problem. But thankfully after a short stay in hospital, she is now on the mend. Looking back at both events, we realised that we had dealt with them in textbook style. So all of those fire drill classes and first aid classes that we have attended over the years paid dividends! Pamela did say however, that we should not get off the boat on the following Sunday. Didn't want to tempt fate! 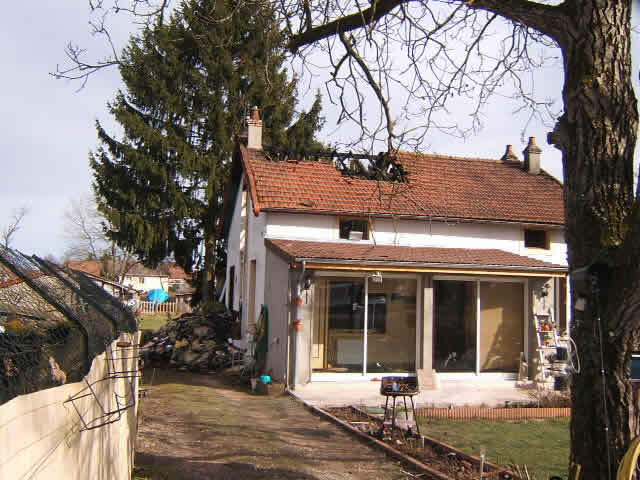 It was very fortunate that Jean-Pierre and Ilse had another property that they were able to move into. 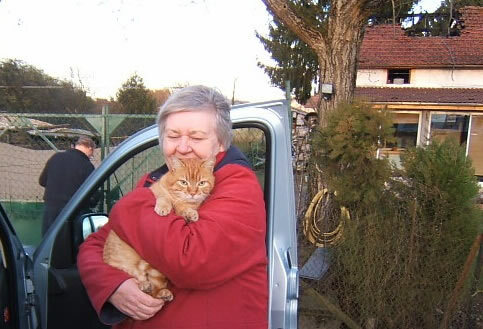 So in our next photo we have Ilse and one of their cats Maurice (the original scaredy cat) moving to their new home with Jean-Pierre locking the gates. 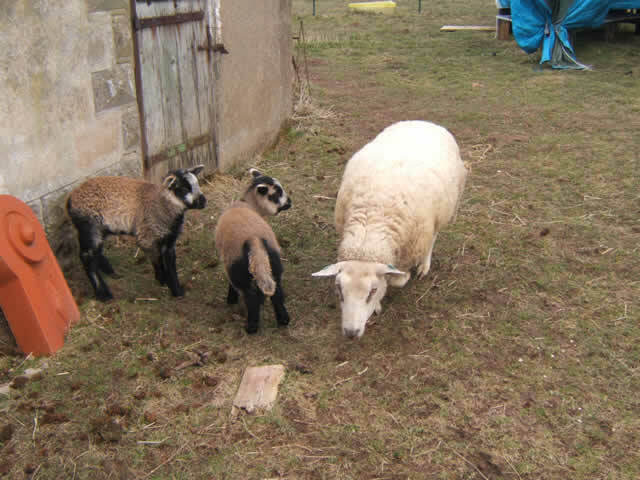 After the fire, the same night in fact, Jean-Pierre's remaining sheep gave birth to 2 lambs and all 3 are healthy and doing well. Maybe one of the lambs should be called Phoenix? Now that Jean-Pierre and Ilse's 2 cats have moved, Gromit has more of a free rein and is able to wander without the risk of being beaten up by Filou and Maurice. 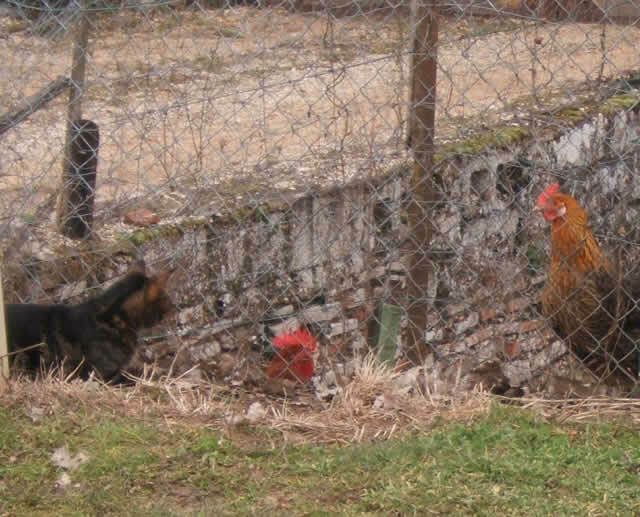 But he still doesn't wander too far and has taken to sitting looking at the hens for hours on end. There is of course a fence between them so he can't get too close. But he does seem to like them a lot. Gromit's other big distraction is of course food. 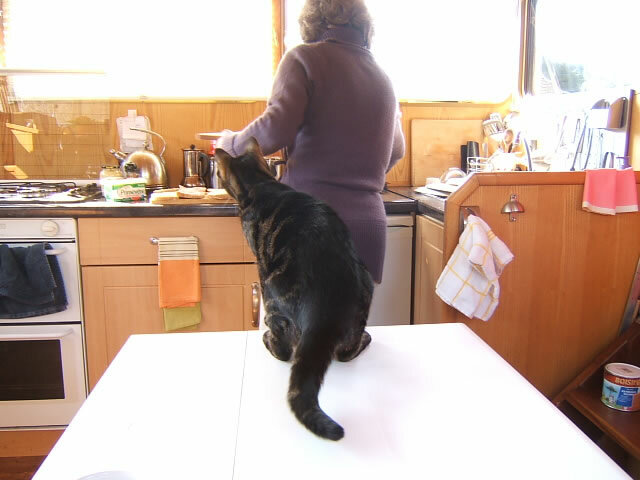 Any movement on a work surface or near the oven might mean a tasty treat. Another Monday walk in the sunshine and this one made us all feel much better. Ken and Rhonda had surprised us all by bringing some coffee and biscuits secreted in the boot of their car. How very civilised. Now it's time for a very small lesson in French. 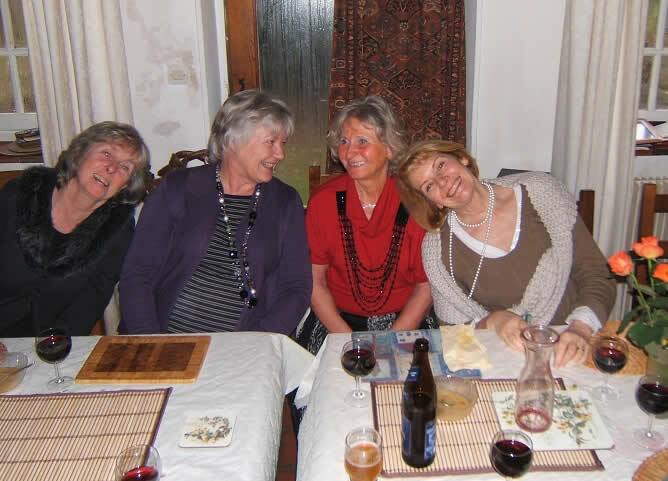 Gérard told us of a Vide Grenier (empty attic - the equivalent of a car boot sale) being held in the next village. So the 3 of us went and had a good look round and managed to buy nothing except 3 glasses of vin chaud (mulled wine). 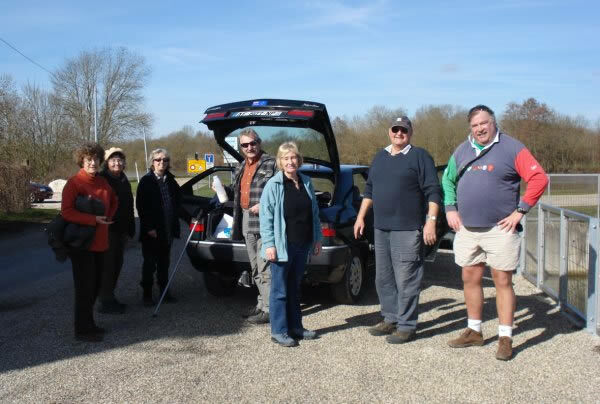 Then back to the boat and feeling a little hungry after all that walking, we had a French style picnic, which in France is often referred to as a casse-croute (literally meaning to break crust). Pain (bread), fromage (cheese), and a verre du vin (glass of wine) and Gérard is in heaven. 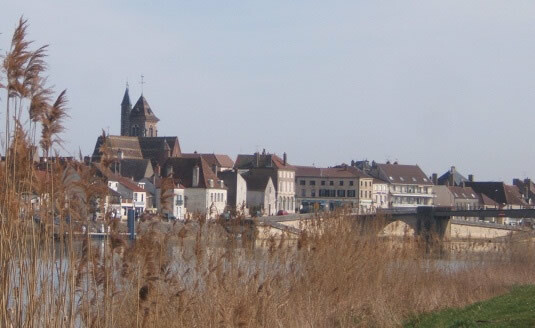 This next photo is yet another view of St. Jean de Losne taken from across the river in Losne. I offered to have a go at making Sylvie and Gérard a sign for their B & B. Now one of the striking features of their garden is a beautiful Wisteria. 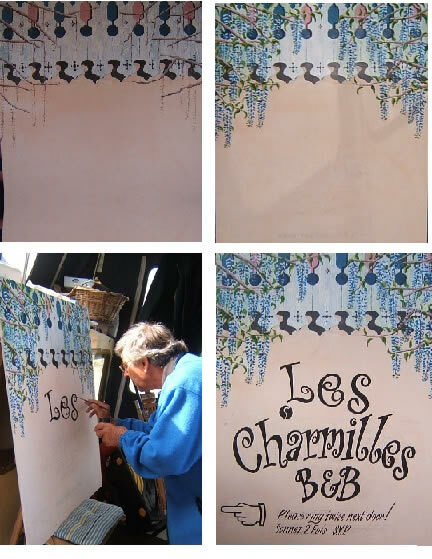 So that, and the wooden cladding that overlooks the garden, became the theme of the sign for "Les Charmilles". I took this to the art group on Wednesdays (usually on the roof rack of the car) and after a leisurely few weeks it was ready for the lettering. We knew that we were due to be visited by a good friend who just happens to be a retired professional signwriter. So it seemed like a good idea to be at the lettering stage as he came through St. Jean de Losne. You can see some of the various stages of the sign in the next photo, including the professional at work and the finished article. Janna also made a contribution to Les Charmilles having done a lovely painting in the Art Deco style for a door in the newly renovated kitchen area. She also has undertaken 4 more paintings to be used on door panels in Sylvie and Gérard's living quarters. We hope to get pictures of these for the next update. 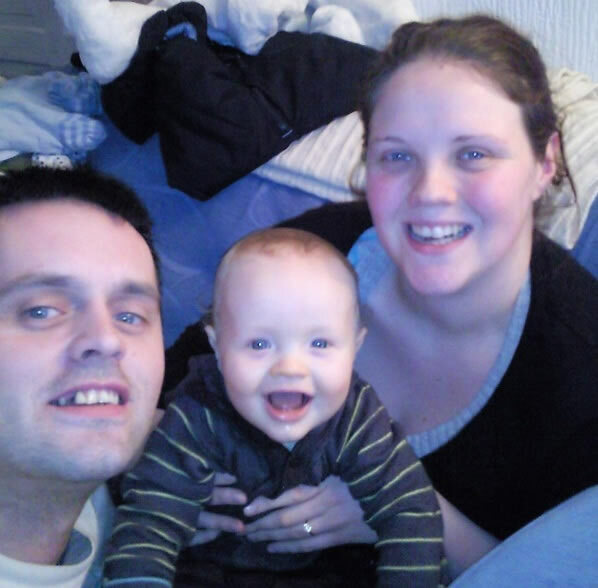 Our last photo includes the latest addition to our extended family, Pamela's newest great nephew Nathan, with his mother Sammi and father Drew. Nathan will be the grand old age of 1 on the 13th of May so we hope that he has a very Happy Birthday! We are going to have a very busy month now, trying to get ready for cruising with 1 or 2 major projects ahead. So, fodder for the next update hopefully!! Best wishes to you all and thanks for taking the time to read these ramblings.